The pair GBP/USD has reached annual highs 1.6820 and at the moment is trading in the range of 1.6650-1.6640. The nearest support level is 1.6600. If this level is broken down, the Pound can continue decline up to 1.6446. British currency is under pressure from a several factors. First of all, many market participants had placed long positions, which led to technical correction. Secondly, unemployment rate rose, amounting to 7.2%, which was against expectations. Under such circumstances government is unlikely to change monetary policy in the near future; therefore hopes for the raise of interest rate are not justified. The head of the Bank of England repeatedly says that the Bank will continue to monitor employment rate in the country as this is the main criteria for changing interest rates. Record rainfall also has a negative impact on British economy. Over 5800 houses in the cities of Chertsey, Egham and Datchet have been flooded. Experts cannot yet estimate what will be the cost of follies of British weather. However the price of houses in the flooded areas has rapidly fallen. 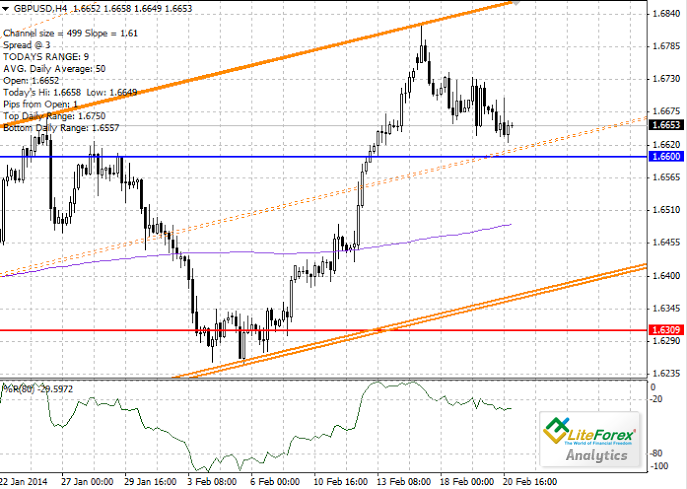 The nearest resistance level is the upper limit of the trading channel (1.6480). Support levels: 1.6600 and 1.6446. It is recommended to open short positions after breakdown of the level of 1.6600 with stop-loss at 1.6630 and a target of 1.6490.